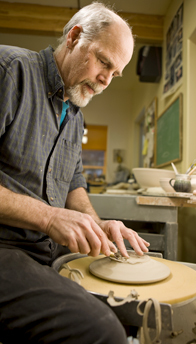 Currently I work in my Homer studio on Kachemak Bay, making my living as a studio potter and sculptor. 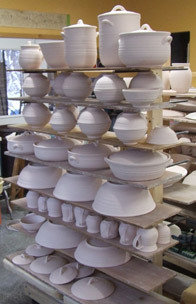 I create my pots to be successful in several ways: comfortable to use, enjoyable to the eye and intriguing. I like how pottery brings art intimately into our everyday lives. Besides their utilitarian value, they are rich metaphors. For instance, the words we use to describe the shapes of pots (lip, neck, shoulder, and belly) reflect our imaging of ourselves in the clay, acknowledging their likeness to living things. Pots similarly relate to our spiritual and emotive spheres. A wide open generous bowl can be intuitively associated with a sense of offering, sustenance and abundance. These ways of relating to form are grounding influences in my work. Pottery is typically sized to fit the embrace of our hands and is a close, unimposing presence where utilitarian and aesthetic considerations are uniquely intertwined. My sculpture, being free from functional requirements, though, tend to be large  4-9’ tall  on a human scale, making the metaphor more obvious. My sculptural forms range from figurative and architectural abstraction to classic pottery shapes. Creating sculpture grows out of my personal need to address certain issues or to express specific feelings  some very universal like love, grief, or the wonder of regeneration. Others deal more temporally with our response to specific environmental and social concerns. My work commonly shows the mark of the maker  one can usually read my finger marks in the clay and sense the irregularity of the hand made object. Leaving finger marks, or coil or paddle impressions visible informs the viewer about my construction methods. My intention here is for viewers to understand some of how the pieces are made, which strengthens the personal connection and draws people to engage the object in a deeper way. I intend my work, whether functional or sculptural, to reach people on an equally deep and personal level, transforming common experience into moments of resonance and reflection.